Unleash the Greatness Inside you | Coach Herbert -Touching lives,inspiring and mentoring through the written and spoken word!. In my life,travels and walk I have met with people from various backgrounds,both black and white rich and poor,but all they have in common is the want to become and be what life has designed them to be.I connect with people just starting out on the career road. So many seem dejected early on by what they see as a lack of opportunities and the uncertainties of a volatile economy. They don’t seem to be able to figure for themselves the best route to take. My career journey accelerated beyond belief the moment I began to focus my time and effort on the things that I love to do.It hasn’t been easy but the day I made up my mind and told Herbert-me,there is greatness in you unleash it,then I pursued relentlessly and when after my dreams with all vigor and passion. Within every one of us lies our inner greatness, the power to excel in the outside world. Each of us has unbelievable infinite capabilities within us just waiting for us to tap into it and then realize our rewards. We need to dream big and then do our utmost to make what it is we dream of. Just as important, we must never give up on those dreams. If Thomas Edison had given up after his many failed attempts he would never have invented the light bulb. Edison said, “I have not failed 1,000 times. I have successfully discovered 1,000 ways to NOT make a light bulb.” He never doubted that ultimately he would succeed. Within himself he had that knowledge that the answers lay within, he just had to uncover them, and it didn’t matter how many unsuccessful attempts he made. 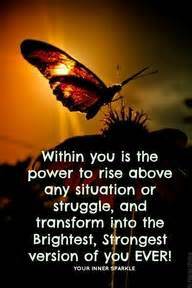 The power that lies within you is truly amazing. How often have you read about the importance of turning your thoughts from negative to positive. Well here let me go one step forward. You can do any dream when it is fully powered by an inner drive that unleashes your inner greatness which in turn taps into that infinite capability that lies within. There can be no more powerful force, and the dramatic results that you can do will be like nothing else. Your starting point is to believe in you and have faith in your abilities. Then find the courage to go for your dreams. You just need to realize you are more powerful than you can possibly imagine. You have a limitless potential. Your inner greatness allows you to see your possibilities, ideas, aspirations, dreams and how to fulfill them. Greatness is achieved by trusting your inner guidance and following through on it. Every one of you should be excited about bringing your greatness to the world. Think about the amazing, extraordinary, impressive impact you will have on everything around you and the world itself. Isn’t that something that will spur you out of your bed every morning filled with energy and passion. I know that greatness lives within every single person and you just have to find your path to that greatness so the world can see you shine. Each and every one of you is uniquely special, blessed and gifted. You can live up to your potential, you just have to want to enough. I know a wonderfully gifted young man,much more gifted than me and many I have come across. So talented, such a wonderful loving person. Yet so doubting of his own abilities. If only he would believe in his potential for greatness, and know that his true greatness lies within him. All he would then have to do is get in touch with this greatness so he was no longer living in the shadow of the life he could be living. As Ralph Waldo Emerson said, “What lies behind us and what lies before us are tiny matters compared to what lies within us.” So it doesn’t matter what has gone before, what type of life has been lived, you have in front of you a path that is yours to take, and create in a wonderful way if you allow your greatness to come to the forefront. To me your starting point is ask yourself, ‘What do you love to do?’ Discover the answer, bring it into your life, be great at doing it! I wish you all the best in finding out the treasures deposited in your life.I wish you good, in finding your greatness, and don’t forget to enjoy the journey! Best wishes to you for the year 2014.